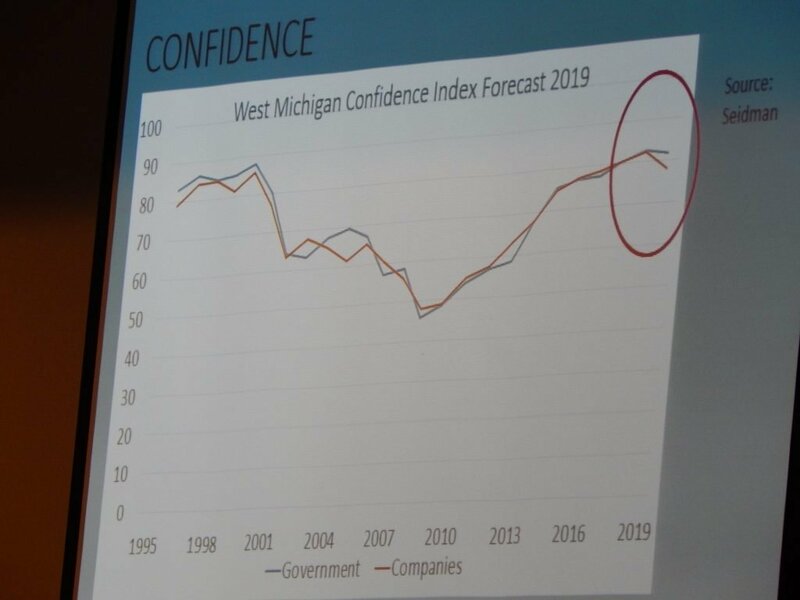 “Current [economic] conditions are worsening, but it doesn’t mean all is lost,” Isely continued, saying he expects Muskegon, West Michigan and the Midwest as a whole to fare better than the United States’ coasts during an upcoming recession. There are several red flags that point to a nearing economic downturn, Isely noted, including rising pessimism among business leaders. “This is the first time since 2008 that there’s been a decrease in confidence among business leaders; remember 2008?” he asked, referring to the Great Recession, which resulted in the United States’ labor market hemorrhaging 8.4 million jobs. Another sign pointing to a recession? Real gross domestic product (GDP) has now surpassed potential GDP—which causes bottlenecks that result in an economic slowdown, such as businesses running out of labor or being unable to borrow funds, Isely explained. Additionally, he emphasized that businesses are increasingly spending income on employees. “You’re having to do that to keep people from being poached, to attract new workers…that is wage inflation,” the economist said. Plus, the costs of doing business are on the rise. None of that is music to business owners’ ears, but the situation isn’t dire—this recession should be nothing compared to 2008, Isely said. That phrase—“if we can find the workers”—is key to Muskegon’s success, the economist stressed. Muskegon, like much of Michigan and the rest of the country, is facing a workforce that’s decreasing in population: people are having fewer kids and fertility rates are expected to keep dropping. Plus, all of Michigan lost workers during the decade-long recession that persisted in the state from 2001 to 2011. “Generation X folks left to Houston, Atlanta, Denver, and other places, and they had their kids there,” Isely said. Recession or no recession, Muskegon (and Michigan) needs to attract workers, the economist noted. Right now, Grand Rapids is surpassing Muskegon when it comes to incentivizing people—including numerous millennials—to move to its city. 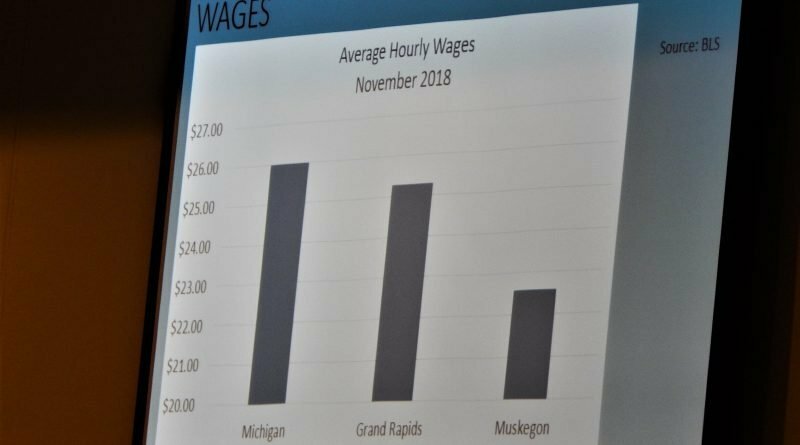 And while wage growth in Muskegon County is a little above 10 percent over last year, this area’s workers are still making less than than the West Michigan region as a whole. 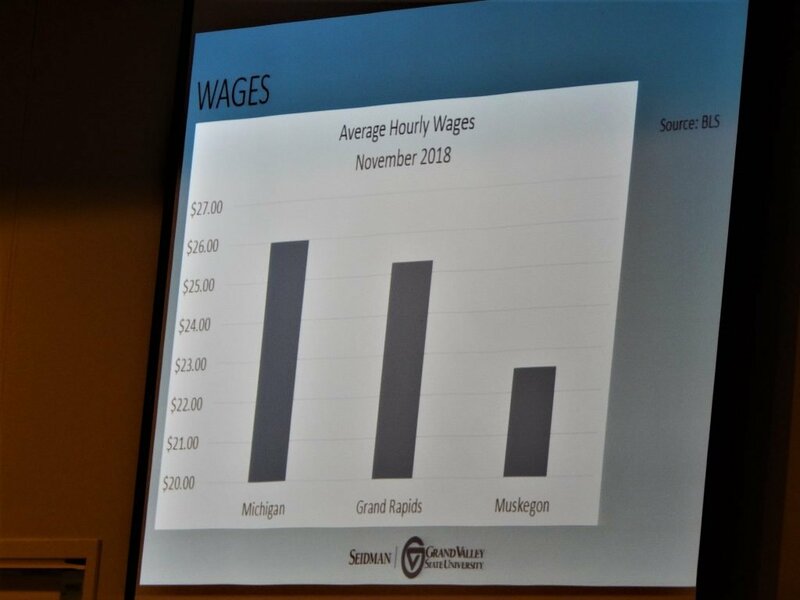 According to the U.S. Bureau of Labor Statistics (BLS), the average hourly wage in Muskegon is about $22.50 as of November 2018, compared to an average of $26 in Michigan and a little more than $25 in Grand Rapids. 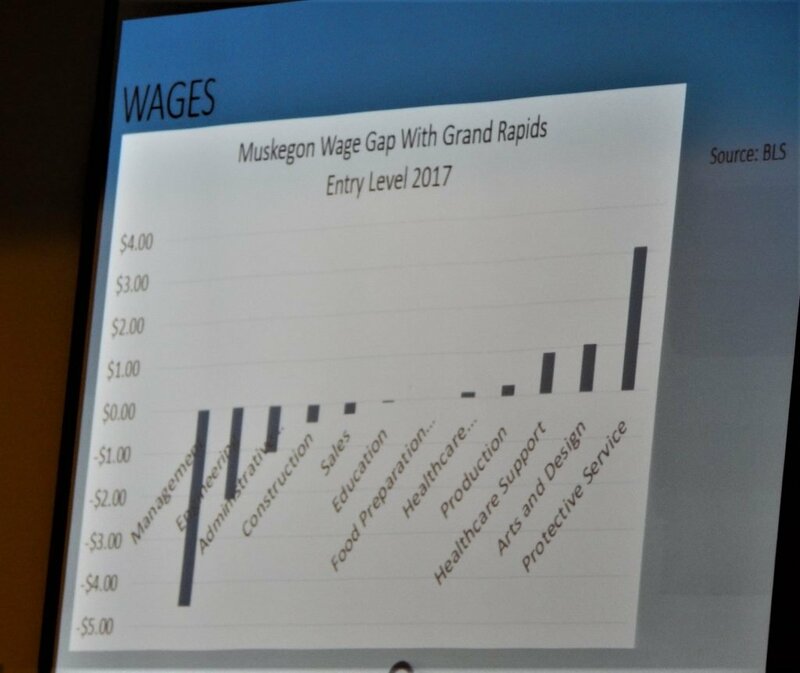 Entry-level management, administrative, construction, engineering, and sales jobs in Muskegon are, on average, paying less than Grand Rapids—though entry-level positions in fields like healthcare, health support, arts and design, and protective services (such as the police) are paying more than Grand Rapids, according to 2017 BLS statistics. “The areas where you’re strong, you’re extremely competitive on wage,” Isely said. Still, millennials are opting for Grand Rapids over Muskegon. “What happens in Kent County is there are more 25 to 35-year-olds than there are people over 65; that’s not the case in Muskegon County,” Isely said. New Muskegon Lakeshore Chamber of Commerce Board of Directors Chairman Tom Schultz announced at the breakfast that the Chamber’s theme for 2019, “taking it outdoors,” which aims to recognize and celebrate outdoors-related businesses, is in part meant to draw millennials to the Muskegon area. “By focusing on these quality-of-life businesses and initiatives, we hope to attract new residents to Muskegon County—specifically millennials,” Schultz said. Conversations surrounding development, such as the incoming Windward Pointe project at the old Sappi site and the former B.C. Cobb power plant, too are generating buzz that is helping to draw individuals to the area, Isely said. Enthusiasm surrounding development is helping grow a more vibrant downtown, he added. In order for people to have money to spend at downtown bars and on other activities—including the city’s evolving outdoors options—the economist encouraged the city to focus on growing its strengths, such as manufacturing jobs that use computers to control machine tools (known as CNC, or Comuter Numerical Control) and aerospace. To further economic growth, Muskegon and the West Michigan region will have to continue addressing a skills gap, the speaker emphasized—something the region has been tackling with, for example, securing more than $1 million in state funding for job training. “Expect you will have a severe talent shortage that should be addressed, and that should be job one in Muskegon,” Isely said. Another daunting economic issue facing Muskegon is trade. Currently, one in nine jobs is related to exports in the state—and it’s a little higher in Muskegon County. That translates to an economy that will directly feel issues in trade—such as the United States and China, the world’s two largest economies, being mired in a continuing trade war that has impacted everything from Michigan’s farms to its scrapyards and entrepreneurship. One of the biggest issues with trade? Uncertainty. “What has happened for us this year—and I don’t care if you’re a Democrat or Republican or agnostic or Communist, we have to understand the political system threw a lot of uncertainty into the game for everyone,” Isely said. Ms. Gustafson, this is an impressive and much welcome write-up. I look forward to future reports on Muskegon’s economy.